This time of year always brings in the Gray Trout just off of NC’s beaches. The fish provide fast action that any age would love to reel in. They have been biting well for the past two weeks and should continue this trend for a while longer. You can not get any simpler of a kind of fishing. Their cousin, the speckled trout, has also made a good showing and is some of the best eating saltwater fish, although they are a little bit harder to catch, they provide a great fight and keep you wanting more. 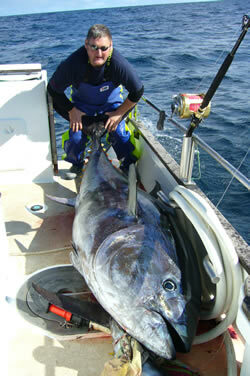 The Drum has also been around lately and has been providing fun for anglers up and down the coast. We recently took a trip to the Pamlico and had a very good time with the large drum. We caught 13 fish over 40 inches, and they were all released healthily. Come join us for this hot inshore and nearshore fishing now. The flounder fishing is also great right now, and should keep up for a few more weeks. The fish have been averaging around 3 lbs. but have been caught up to 10 lbs. They are willing to bite and prove to be a worthy adversary for any angler novice or pro. 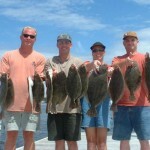 Come join us for a fun day of inshore flounder fishing around Carolina Beach and the Cape Fear River. I can honestly say this is probably the best fishing going on right now. 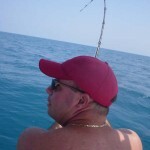 The great thing is that you are just off of the beach, bait is plentiful, and the fish are BIG. Over the past two weeks, this has been our main type of fishing and many days we are going into the 20’s with the number of hits we get. All of these fish go 15 to 40 lbs and there are no small fish mixed in. They are skying on the baits and are putting on quite a show for our clients. This time of year gives you the real possibility of catching your fish of a lifetime. The 2008 season has been great so far with many different species of fish biting. The flounder have been biting well, with most of the fish being keeper size and a few fish hitting the 4 lb mark. 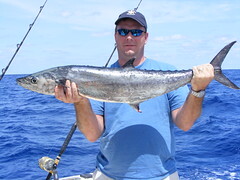 The king mackerel have been biting great and are about 12 miles off the beach, so it makes for a good half a day. These kings are not only biting well, but are big also. We have had several fish in this area go up to 25 lbs and three over 30 lbs. They are putting on a great show when biting and have been skying on the baits. The grouper bite has been the best in years with many limits coming and several 20 lb fish as well. There are plenty to make you take a break as well. Sailfish and dolphin are also around and willing to bite a live bait when its trolled in front of them. Tarpon have showed up in there usual spots and will be willing to bite big mullet when available. Call us to book your trip today, the books are filling up fast. Well, we were finally able to get offshore and fish the beautiful water of Southeastern North Carolina. We headed out of Wrightsville Beach, and started fishing soon after. The bluefish are everywhere from 1 to 3 miles off of the beach right now. There are a few Bonito around, but they seem to be to the north now. We fished for a little while and it was just so dang pretty that we carried the clients offshore. There are tons of glass minnows out there from 7 miles to 18 miles. This only means that the Spanish mackeral will be right on their tails, chompin’ away. We then proceeded to catch very nice keeper Black Sea Bass and Flounder to our surprise and the clients couldn’t have been any happier, we also pulled out a triggerfish and some grunts. They went home with a good sized meal for the both of them and had a great time. The next day we decided to go shad fishing and caught 46 fish in 4 hours, it was just about non-stop action. These are some of the hardest fighting fish caught on ultralight reels and 10 lb test. We hope to have a video with the shad action on here tomorrow. Things are getting better everyday and wth this steady warm weather coming up, it should pull everything together in the next two weeks. Southeast North Carolina Fishing Report- SPANISHHHH!!!! The nearshore fishing has improved durastically over the past week. We worked the offshore waters of Carolina Beach today and found the Spanish Mackeral have arrived and in good numbers and size. In an hour and a half we boated over 20 spanish and easily as many blues. The fish were all good keepers and the Spanish ranged up to 6 lbs. The blues were all about 2 to 3 lbs and put up a good fight. These fish can be caught casting or trolling through them. They will show up in better numbers as the weeks increase, but they are here good enough now that they can be fished for specifically. The trout are still sticking around, but there are not that many. Flounder are offshore, but moving in, and should be found in a few weeks around the nearshore wrecks. The next big thing we are waiting for is the Cobia. They should be showing up at any time and will put up a great fight and some of the best table fare that saltwater fishing has to offer. Call us to book your trip today. Thursday started out to be one of the most beautiful days on the ocean that I have ever seen. We ran 55 mph all the way out to the stream. We started out jigging and the kings just kept cutting us off so we switched up and started trolling. IN three minutes a nice chunky blackfin hit the deck to break in the guys new Seacraft. We trolled for a while then we got to the spot. First one was a nice wahoo that was 50+, then a dolphin followed. Then another nice 40+ wahoo and the next one broke us off. We ran out of bait due to some dolphin short striking and we ran back to do some more grouper fishing. We started off with a nice red, then we jigged up about 10 speckled hinds but they were all short. Three more grouper came in the boat that were keepers before the day was over and it got a little bit sporty so we headed back in. Call us to book your trip today. I just want to throw in the we saw THREE Blue Marlin free jumping while we were at the stream and a Mako shark, so it looks likw it will be another great year for billfish.